When people think of empathy, they tend to see it as a soft skill — as a yielding and pleasing kind of behavior. They think: If you listen to me and agree with me and make me feel good, that’s empathy. If you fix my problems and soothe everything, that’s empathy. Empathy equals niceness. But there’s actually a deeper form of empathy that transcends mere niceness and helps us engage with people across lines of discord, difficulty, pain, and trouble. I call this a full-bodied empathy, and it is a deeply emotive process that makes room for things that that don’t feel good and don’t seem particularly nice. In this deeper form of empathy, you don’t jump in to fix things right away. Instead, you create a space for people to sit with problems and conflicts until they are able to find the brilliance (their own brilliance; not yours) sitting just beneath it. This deeper form of empathy requires patience and emotional awareness, but it also requires a basic trust in people’s ability to deal with conflict and to listen closely to their own emotions. And this deep form of empathy doesn’t look like niceness, because it works in a different way than niceness does. The mythologist Michael Meade has written beautifully about the difference between niceness and deep empathy in this piece on the First, Second, and Third Layers of human interaction. 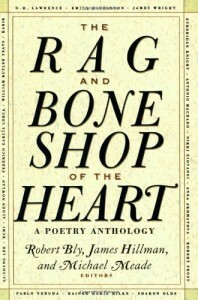 This excerpt is from The Rag and Bone Shop of the Heart by Robert Bly, James Hillman, and Michael Meade (Harper Collins, 1992). If the First Layer of human interaction is the common ground of manners, kind speech, polite greeting, and working agreements; if the Third Layer is the area of deeply shared humanity, the universal brotherhood and sisterhood of all people, of the underlying, fundamental oneness of human love, justice, and peaceful coexistence; then the Second Layer is the territory of anger, hatred, wrath, rage, outrage, jealousy, envy, contempt, disgust, and acrimony. It is the Via Negativa, the field of Conflict, the plain of Discord, the hills of Turmoil. And, the Second Layer always exists between the First Layer the Third…. All three layers are necessary for a society to continue, for a relationship to endure, for an individual to endure…. We know that the decency of the First Layer must be kept intact most of the time, for the sake of social survival. The First Layer doesn’t have to carry true emotions, hard-learned insights, or personal authenticity. But if an individual or a society stays only in the surface level of life, a huge shadow starts to grow in the Second Layer. As I look around at many of the ideas and teaching on empathy today, I see a lot of First Layer focus where people try to create working agreements and social ease with politeness. It is the empathy of friendliness, agreement, and niceness. It is very sweet and lovely, but it isn’t deep empathy. And what I notice is that this niceness-based empathy tends to bring forward an undercurrent of hostility and trouble that shocks people and throws them off their game. They feel betrayed, and try to get back to that First Layer, but that’s not really workable once the Second Layer has emerged. I see this behavior continually on the Internet, where people will be commenting on a funny video of a cat or something, and some random person will start fighting and pull the entire thread into chaos. For instance, this hilarious play-by-play story of an Internet thread war that erupted on a post about cake(!) is priceless: Rainbow Cake Recipe Inspires Comment Apocalypse. When the Second Layer emerges, people tend to lose their empathy for each other, and some will get sucked into a Second Layer pile-up of escalating rudeness and cruelty, but almost no one knows how to get to the Third Layer. You’ll often see people trying like mad to get the situation back to the nice and polite First Layer (Can’t we all just get along? ), or you’ll see people trumpeting the Second Layer as if it is the most honest way to be, or as if it’s the best way to get a point across (these people tend to disparage politeness, and they often hurl the insult Tone Police at anyone who challenges them). But almost no one knows how to get to the Third Layer. That’s what deep empathy is for. The population of the Second Layer includes a high percentage of giants, hags, trolls, boxers, bears, street criminals, cops, vultures, gargoyles, streetwalkers, and outraged motorists. The sidewalks are cracked, the stores are closed, the lights don’t work, and there is no one who’ll listen to you. When people avoid entering this territory, they begin attracting shadowy figures who will one day explode into their life. Or, like a TV evangelist, they are completely drawn to the figures of the night. Cultures that try to shut out the Second Layer wind up with overcrowded prisons, high crime rates, huge black markets, and, finally, riots in the streets. There’s more bad news. The only way out of the First Layer, the only way to break the spell of niceness when it has shifted from ensuring life’s continuance to insulting life’s purpose is to enter the Second Layer. Furthermore — and don’t blame this on me — the only way to find the next location of the Third Layer is by traversing the battle-scarred, dog-infested terrain of the Second Layer. The Third Layer — which is where “deeply shared humanity, the universal brotherhood and sisterhood of all people, of the underlying, fundamental oneness of human love, justice, and peaceful coexistence” exists — cannot be located through niceness and politeness of the First Layer. The First Layer is necessary, but it has its limitations. The Third Layer also cannot be located if people merely get stuck in the Second Layer and throw their intense emotions (and blame) all over the place. The Third Layer can only be located when people have the patience and the skill to navigate through the intense emotions of the Second Layer — to listen to them, to work with them, to engage with their ancient wisdom, and to become fully fluent in the language of emotions. This process of locating the Third Layer clearly doesn’t happen every day. But when it does, and when combatants can learn how to transform the power of their intense emotions into the power of vulnerability, and how to listen to and honor the truth of their intense emotions, miracles can happen. I’ve seen it. I’ve been to the Third Layer. It’s a magical place. But politeness and the pastel-colored empathy of niceness can’t lead you there. Only deep empathy — which gives you the patience and the skills to traverse the battle-scarred terrain of the Second Layer — only deep empathy can do that. That’s the difference. That’s also the art of empathy. Michael Meade works regularly in areas of conflict to help people find their way to the Third Layer. He’s a national treasure, and if you have a chance to take a workshop with him or support his work, do it! You can learn more about Michael’s work at his Mosaic Multicultural Foundation. Thank You Karla, very good observations about the day to day interactions with empathy. I really agree with full-bodied (I use robust). Michael Meade’s reference really helps understand multidimensionally our day to day interactions. Thank you Mike! Yes, patience is so needed. Sometimes, people get so attached to the First Layer of politeness that they can’t get out of it, and very long-term patience is required from people dealing with them. The same is true for people who are trapped in the Second Layer. There are entire communities on the Internet full of people who think that the Second Layer is the final layer! I’ve been in contact with some of these communities, and it can take people years to finally wake up and move forward. The Second Layer is so full of fireworks and activity that it feels to some people like life itself. What’s fascinating to me is that Michael talks about the Third Layer being a moving location. It’s not in the same place every time, and people have to move through the Second Layer skillfully to get there — each time. It’s a continual, lifetime practice — not of trying to jump the line, but of working honestly and with dedication in the tumultuous emotions and troubling issues that live in the Second Layer. That’s good, hard work if you can get it! This is a beautiful way of setting out what empathy really looks like. As I was reading it, I was thinking that we often view that second layer as the opposite of empathy, when actually it’s a key part of the process and empathy springs from how we respond to those heavy, intense feelings. Hello Hannah — that’s a lovely realization; yes. It’s how we move through the Second Layer that determines whether we’ll ever get to the Third. I wonder if it’s possible to go directly from the first layer of empathy (giving things to people because I like to share) straight to the third layer (leaving a room because the other person in it is upset and I sense they need space)? I don’t think I’ve ever been as abrasive in the examples above, but I could be wrong of course. Hello Sheogorath. I think that both of the examples you’re giving are in the area of niceness. Moving through the second layer might mean being willing to be uncomfortable with the person until they’re able to speak their difficulty. Of course, every situation is entirely different, and I might be wrong about the example you’re giving. For me, moving through the second layer means being willing to be in conflict and then (this is the crucial part) having the strength and vulnerability to listen to each of the emotions and work through them on their own terms. For instance, if there’s anger or rage, and I know those are about boundaries, I ask the questions (often internally) for anger, and stay with the situation until the boundary damage has been identified, and the boundaries have been restored. This isn’t something you see everyday. Generally when people get angry, others will fight with them, or abandon them. People tend not to listen empathically to what the anger or the angry person is trying to say. There are some magic keys for traversing through the second layer. The first is understanding what the emotions are saying, and what they’re for. The second is to have patience and trust that people will be able to come through the second layer. And the third is to be vulnerable and willing to be changed utterly by what is occurring in the second layer. As I look at those keys, I’d say that the real sticking point, once a person has learned the language of emotions and knows how to be vulnerable without being weak, is to identify whether others can indeed move through the second layer. We’ve all known people who can only do second layer emotion displays — they don’t currently have the trust or the skills to make it past that layer. These would be people who blow up a lot, or who repeat very similar emotion displays for many situations. They’re learning how to do the second layer, and they’re not ready to move onward. There are also people who cannot go to the second layer at all. If there’s a conflict brewing, they’ll focus on peacemaking, niceness, “can’t we all get along?” behaviors, or they’ll disappear. For those people, conflict often feels too dangerous. It could be that they grew up in second layer homes, and never saw anything but pointless brutality there. Many people have no skills in the second layer, and they just avoid it to the extent that they — or anyone — can. But when people can tolerate the second layer and know how to be awake, patient, and vulnerable there, magic can happen. I would still say that leaving a room because someone’s upset isn’t first layer. It isn’t someone saying, “Leave me alone, please,” and me doing so to be nice, it’s me sensing something’s wrong by picking up on their emotion and acting accordingly. Ah, Sheogorath, I think we’re talking about entirely different things. Responding to an unasked request can be empathic, yes. But the layer issues I’m talking about here are different. This would refer to people being in direct conflict with each other. Thank you so much Mark! And thank you for bringing so much more emotional awareness and empathy into a world that needs both. I appreciate you! Hi Karla, I really appreciate your work. I loved your books and find the Language of Emotion cards incredibly helpful for my continuing work with emotions in my life. In fact, they were helpful in applying the 1st, 2nd and 3rd layer interaction idea with all the emotions. One thing that struck me in applying my cards to the ideas of this article is how deep empathy requires some kind of boundary change from both people in the aftermath of turmoil or anger – thinking of the dynamics of channeling anger you described on the boundary card here. Overall, a wonderful new way of relating to those second layer emotions (as opportunities to create Love for ones self and for others). This definitely reduces my shame about the anger emotions even further. Those emotions are just love vehicles in disguise! I know you’ve talked about love in your writing but noticed You didn’t include it in your set of emotions cards. If you made a love card, what do you think it would have on it? Loving continuing to bring things together. Thanks for Tweeting this link today! Thanks for your insights; you’re right that when anger is used honorably, both people will need to shift their boundaries to encompass the new ideas that are generated.